NEWS ANALYSIS: Since its inception around two decades ago, Norwegians have arguably had a love-hate relationship with their huge so-called “Oil Fund” that invests the country’s oil revenues. Debate over how the fund’s mind-boggling wealth should be managed, monitored and spent has now reached fever pitch, perhaps because it’s the wealth itself that often seems to terrify rather than gratify leaders of a country still more accustomed to viewing itself as small and modest than rich and powerful. The latest figures released this week show the oil fund as now being worth 7,300 billion Norwegian kroner as of Wednesday, an amount so large that it’s difficult to write in numbers. Norway’s Oil Fund ranks as the largest sovereign wealth fund in the world, with shares in more than 9,000 companies worldwide and a sizeable portfolio of high-end real estate in cities like London, Paris and New York. Third-quarter results showed an unusual negative return because of rocky stock markets, but the fund’s chief executive, Yngve Slyngstad, could point out that it only took the fund a few weeks into the fourth quarter to reverse a loss of NOK 273 billion with a gain of NOK 300 billion. That illustrated how the fund itself is constantly subject to market swings, for better or worse. Its total average annual return over the years has been 5.9 percent, better than the reference index against which it’s measured. That indicates steady and successful asset management even though Slyngstad and his boss, central bank chief Øystein Olsen, recently have been the targets of harsh criticism. Several Norwegian economists and media commentators have questioned their control of the fund and allegedly selective reporting of fund managers’ presentations. Olsen responded last summer by setting up a group of experts who could offer advice on new reporting methods, due to be introduced next year. There’s no question that Norwegian political leaders were highly prudent in setting up the Oil Fund in the 1990s and they’ve exercised enormous restraint and even more prudence in the years since. The idea was to save and invest the vast majority of Norway’s oil revenues for future generations, with strict limits on how much of the money could be used at present. 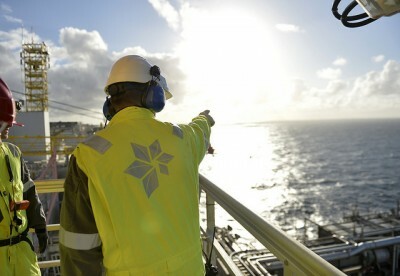 Norway’s prudence and management of its wealth have won praise and respect from abroad. In the process, Norway has become a very wealthy country indeed but some political, academic, labour and even business leaders often seem uncomfortable in the role. No one, it seems, could foresee just how quickly the fund would grow and how huge Norway’s oil wealth would become. The Oil Fund, officially known as Statens Pensjonsfond Utland, was envisioned as a pension fund that would invest in stock markets abroad. Its development has instead turned “Little Norway” into one of the most powerful investors and potential market-movers in the world. During the past several months, the fund has been playing an even bigger role in the local news than usual, and not just over how much of its money can be spent. Paramount among the reasons for all the attention is debate whether the fund has simply become too large for Norway’s central bank (Norges Bank) and the finance ministry to handle. Calls have gone out to set up an independent monitoring agency for the fund, to enhance transparency and introduce the new reporting methods, to set up its own board of directors outside the central bank and even to split up the fund. Debate is also flying over whether there should be more political rather than state administrative control over the fund, like what happened when the Parliament ordered divestment of shares in coal companies earlier this year. That caught a lot of international attention, but in reality, much of the fund’s coal investments already had been sold before the much-publicized political orders were handed down. They simply weren’t seen as being profitable enough. Last year’s dive in oil prices has also led to many news stories about how the fund’s long-term growth will be affected. With oil prices still low, and Norway’s oil-fueled economy slowing down as a result, many economists have been quick to point out that growth will decline because not nearly as much “fresh oil revenue” will flow into the fund. By the end of the first half of this year, the actual amount of oil money deposited into the fund fell by 80 percent, from NOK 85 billion in the first half of 2014 to just NOK 17 billion between January and the end of June this year. That in turn has prompted calls to change the rule (called handlingsregelen) governing how much oil money can be spent instead of saved in the fund. The rule currently restricts spending to an annual amount equal to 4 percent of the size of the total fund, because 4 percent was seen as the fund’s average rate of return (not the 5.9 percent it has achieved). This year, Finance Minister Siv Jensen budgeted with an amount equal to only 2.6 percent of the fund and she has proposed 2.8 percent for next year. That’s well within the rule but critics have nonetheless been claiming the actual amount of money is far too much and increasing far too rapidly, since the fund itself has grown so much. On Thursday, economist Steinar Holden, a professor at the University of Oslo, wrote a column in newspaper Dagens Næringsliv (DN) suggesting it was time to make a new rule. He thinks 4 percent, which was viewed as highly prudent and conservative just a few years ago, now equates to too much money as a percentage of mainland GNP in Norway. He points to the vastly reduced amounts of fresh capital available to deposit into the fund, notes that lower interest rates can mean lower returns, and even fusses that the recent weakness of the Norwegian krone (otherwise viewed as a good thing in times of economic slowdown because it prices exports more competitively) will ultimately reverse, and a stronger krone in the future will further reduce the value of the fund as measured in the local currency. “All this can be summed up by saying that we can quickly land in a situation where we’re eating into the fund’s capital,” Holden wrote. Many others have also been criticizing Finance Minister Jensen for using too much oil money in the state budget, even though she could use much more without breaking current rules and even though Norway currently faces some extraordinary and unforeseen expenses. DN reports that the sudden arrival of thousands of refugees in Norway is, for example, costing the country NOK 9.5 billion. Oil money can help cover those costs. Norway is also facing rising unemployment because of the oil industry slowdown, consumer spending has declined and business pessimism has risen. The government also has earmarked at least NOK 2.5 billion for various measures to stimulate more employment. Savings accounts, which is what the oil fund really is in many ways, are usually set up to provide for the proverbial rainy day. Now it’s figuratively pouring in Norway, but Jensen has had to fiercely defend her decision to dip into the piggy bank. Once again, many other Norwegian leaders are reluctant to recognize that they have the biggest and best financial cushion in the world. They resist tapping into the country’s vast wealth to cover current expenses. Many would prefer to raise taxes and/or cut other public services. The Oil Fund thus continues to be discussed and scrutinized within Norway as if it were a problem instead of a huge resource. And so the soul-searching and arguing goes on. This week, Jensen’s ministry was advertising in local newspapers for a new deputy governor for the central bank, a new position at Norges Bank that will have direct responsibility for the Oil Fund. At least that move, aimed at strengthening control over the fund, was welcomed by critics of allegedly deficient control. The new oil fund executive is due to be in place from January 1. Meanwhile, on Friday, Jensen and Prime Minister Erna Solberg are due to outline how they intend to pay for the current refugee crisis and offset Norway’s economic slowdown, and how much oil fund money might be used.